PAGASA update on Bagyong Henry for Friday, July 18, 2014: The tropical storm East of Northern Mindanao has entered the PH Area of Responsibility. At 8 a.m., the state weather bureau reported that the storm's eye was spotted at 890 kilometers East of Guiuan, Eastern Samar with maximum sustained winds of 65 kilometers per hour near the center and gustiness of up to 80 kph. 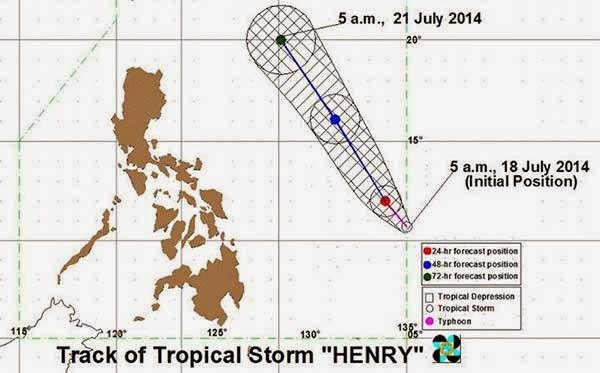 Bagyong Henry is forecast to move North Northwest at 7 kph. It is expected to be at 800 km East of Guiuan, Eastern Samar by Saturday morning and at 860 km East of Casiguran, Aurora by Sunday morning. By Monday morning, it is expected to be at 600 km East of Basco, Batanes, according to PAGASA. State forecasters estimated that the rainfall amount is from 7.5 to 15 millimeters per hour (moderate to heavy) within the 400-km diameter of the cylone. The tropical storm will not yet affect any part of the country, the weather agency stated. The public and the disaster risk reduction and management council concerned are advised to take appropriate actions and watch for the next bulletin, PAGASA added.